I noticed that my Google Chrome bookmark bar along the top of the screen had disappeared. It would only reappear on certain web sites such as the Home page. I guess I must have hit something accidentally to make it do this. 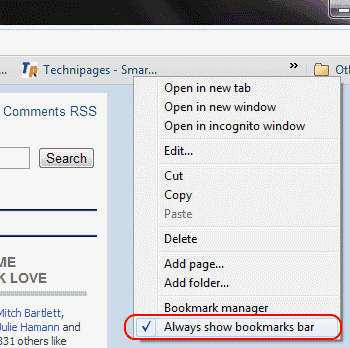 The bookmark toolbar should now stay in place. 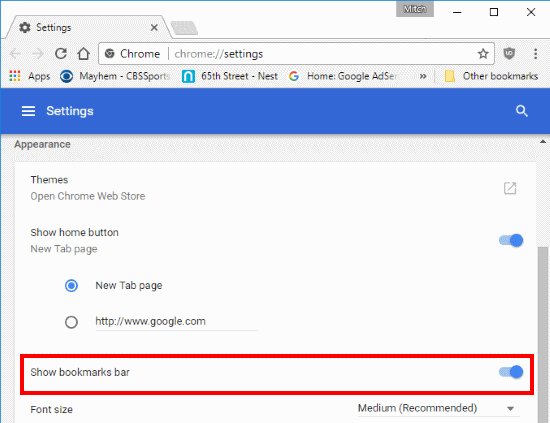 You can use the same keystrokes (which you may accidentally hit from time to time) to toggle it back and forth and remove the bar if you’d like to browse the web in a bigger window. Select the “Menu” button in the upper-right corner, then choose “Settings“. A friend’s Favorites/Bookmark bar disappeared. Clicking on the three dots, then on Bookmarks when that pops up, It has a check mark in front of Show bookmarks bar. On the Settings/Appearance menu, shown in your article, the Show bookmarks bar is on (to the right, as you show), but the Bookmarks bar does not appear.